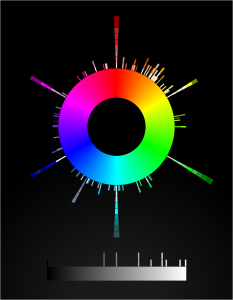 Saturday, April 6th, 2019, 0100 hours: I’ve just updated the visualization to support mouse scrollwheel zooming; scroll upward/forward to zoom in, and downward/backward to zoom out. The text is also laid out with SVG+CSS instead of HTML+CSS, so it will maintain its placement and relative size regardless of zoom level. I took the opportunity to move grayscale labels to the grayscale gradient, instead of forcing them into the center of the color wheel. Sunday, April 7th. 0023 hours: click-dragging of the image with a mouse is now supported. This comes in handy when you zoom in close and realize you cut off something, like the center of the wheel where the color name and HSL value are displayed.